Lots more photos of Kilmer, Rooney Mara, bands and fans in our slideshow. As we've known for at least a year now, director Terrence Malick has been making a movie in Austin. Film gossip sites say the movie is about a love triangle, set to the backdrop of Austin's music scene, and will be called Lawless. Last year Ryan Gosling caroused the grounds at Fun Fun Fun Fest, and just last month Malick himself was at Austin City Limits, camera in hand, filming scenes with Gosling, Girl With the Dragon Tattoo star Rooney Mara, Prometheus actor Michael Fassbender and Christian Bale. 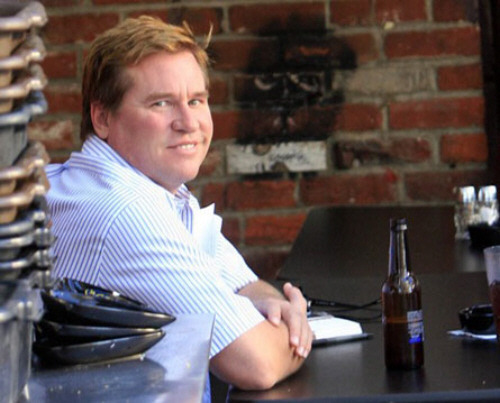 Yesterday at Fun Fun Fun Fest, Val Kilmer was added to the mix. As Craig Hlavaty said, that's two Batmans in one movie. Kilmer was wandering through the backstage area early in the afternoon, and around 6 p.m. the Black Lips took to the Blue Stage for an unscheduled performance during which Kilmer ranted pretty much incoherently onstage. Here he introduces Mara as Miley Cyrus and talks about Michael Fassbender's "assets," which are clearly visible in the film Shame. (Ahem, NSFW.) There was more. There was so much more: Kilmer smashing a guitar, Kilmer ranting about the end of the world, Kilmer offering to read a letter from his mother. I'm sure he was acting. God. I hope this was an act. He's thankfully slimmed down a little bit, but this is no Top Gun-era Kilmer. Instead he looked more like puffy Jim Morrison, and behaved onstage a bit like him, too, Svengali-esque, ranting about shaving his head. He also must have been somewhat heckled by the crowd, because he yelled, "You wanna hear some Doors songs? Well, you're 20 years too late." Later in the evening, Iceman filmed another scene behind the Orange Stage, just before Santigold went on. It involved Kilmer pounding on the windows of a cab and screaming at whoever was inside. I got a good look at this one because they must have filmed it about eight times.